"Máme velkou radost, že můžeme přijet znovu, zahrát na OEF 2017 a ukázat naši pravou tvář. Rád bych se omluvil našim fans za svou indispozici během vystoupení na OEF 2016, která byla zapříčiněna zdravotními problémy. Slibujeme, že se vrátíme dvakrát tak silní! Díky všem, kdo nám věří." Mohli bychom lehce změnit loňský promo text a nikdo by to asi nepoznal, ale v případě téhle kapely se to nesluší. Takže milí gore/grind maniaci a příznivci Obscene Extreme Festivalu vězte, že Dead Infection jsou jednou z prvních potvrzených kapel pro rok 2017! Po letošním kolapsu bubeníka bude tahle polská gore/grind legenda na 100% připravena rozsekat všechno v okruhu několika desítek metrů od pódia na trutnovském Bojišti! 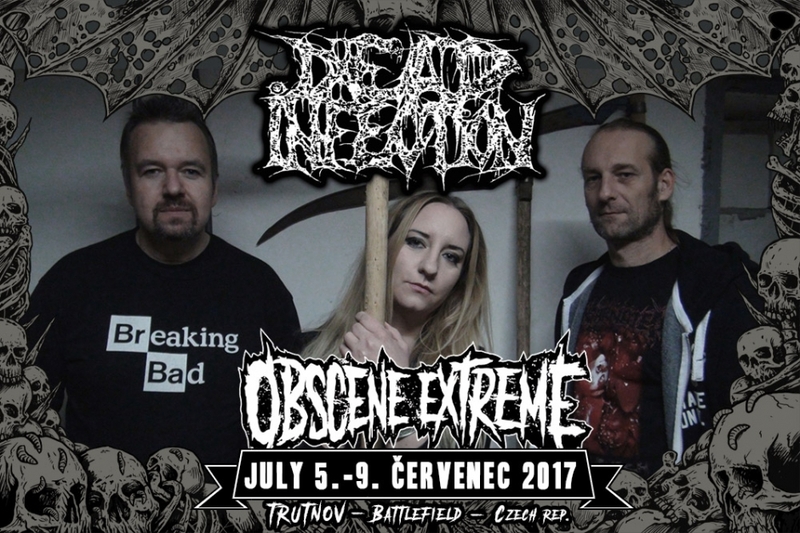 DEAD INFECTION na OEF 2017!!! The band was formed in January 1990 by Cyjan-dr. and Domin-g.,voc. /-ex members of grindcore band FRONT TERROR/. A few months later guitarplayer Jackson is involved. The band starts to play its first shows. In the meantime, Cyjan meets Kelner-g. and Mały-g. and supports them on drums in their deathmetal project called TERMINATOR. After short cooperation Jackson leaves DEAD INFECTION. Because TERMINATOR gets some line-up problems as well, Kelner and Mały decide to break up their band and at Cyjan's request they join DEAD INFECTION. When the line-up seems to be stabilized, Domin suddenly leaves the band. But soon, bass player Gołab /-ex D.O.C./ is involved, and Kelner beside bass takes also vocal parts. The band starts workin' on a first demo tape. In the middle of 1991 "World full of remains" demo tape is released. This stuff gets a lot of good reviews, and the band playes shows across Poland. On Autumn the same year, because of personal matters Kelner leaves the band. Then guitarplayer Tocha is involved pretty soon, and Gołab takes vocal parts. The band prepares new songs for a second demo tape. In Spring 1992 "Start human slaughter" second tape is released. In the Summer the band takes its part at a biggest polish festivals like "Jarocin", "Shark attack", "Strashydlo", ”Drrama”, playing along with bands like: VADER, DISHARMONIC ORCHESTRA, MORGOTH, SAMAEL, EXCULCERATION. Second tape makes the band famous abroad where it gets very good reviews. In Autumn because of internal misunderstandings Gołab is removed from DEAD INFECTION, and his place is taken by Kelner again. In December, the band playes its first show abroad, in St. Petersburg /Russia/. In Spring 1993 the band gets offer from german label Morbid Records for releasing first full length album. In Summer "Surgical disembowelment" LP/CD is released. The band keeps playing a lot of shows across Poland, and in Autumn goes to Germany for mini tour along with PROTECTOR. In Spring 1994 Kelner finally leaves the band. Not long after, new singer Jaro is involved. In May "Party's over" split EP with german BLOOD is released, and the band plays more shows abroad. At the beginning of 1995 the band gets next offer from Morbid Records for releasing second full lenght album. In Summer "A chapter of accidents" CD is released. On this release the band returned to the roots of grindcore. The band still plays a lot of shows across Europe including tour with REGURGITATE. Year 1996 brings a big European tour called "Grind over Europe". DEAD INFECTION plays as a headliner being supported by HAEMORRHAGE and C.S.S.O. Also other bands like INHUME, AGATHOCLES, MALIGNANT TUMOUR, MUCOPURULENT appear on individual shows of this tour. In year 1997 old demo tapes are released in CD format under the title "Human slaughter...till remains". The band plays many shows and festivals in Europe. Year 1998 and another two split EPs are released: "Poppy seed cake" with japanese C.S.S.O. , and "No pate, no mind" with czech MALIGNANT TUMOUR. The band also prepares "The greatest shits" CD. Tribute album including the band’s favorite cover-songs from bands like: CARCASS, NAPALM DEATH, GENERAL SURGERY, REGURGITATE and... BEE GEES. In January 1999 the band plays its last show in Paris. Soon, due to misunderstanding inside the band, Cyjan decides to disband DEAD INFECTION. Year 2001 - DEAD INFECTION takes its part on "Requiem of revulsion" CD /CARCASS tribute/. The band plays a cover-song called "Pungent excruciation". At the end of of 2002, after the meeting with the rest of the band and to clarify various issues, Cyjan decides to bring DEAD INFECTION back to life. Re-union line-up is: Cyjan, Jaro, and Tocha. The band is working on new stuff. In the meantime plays shows, festivals and tours across the Europe, and in Autumn 2003 is invited for the first time to Japan. In December 2004 "Brain corrosion" CD is released for japanese Obliteration Records. In Spring 2005 bass player Pierścień /INCARNATED/ is involved. The band is touring across Europe with belgian SUHRIM and showing in Russia. In Spring 2006 because of personal matters Tocha leaves the band, and Pierścień takes guitar parts. New bassplayer is Hal /HERMH, ABUSED MAJESTY/. In Autumn Jaro finally leaves the band. Both Pierścień and Hal take vocal parts. Old demo tapes are release on vinyl as well as ”Brain corossion” album. In year 2007 band is working on new stuff and still touring across the Europe. Soon for first time the band gets offer for tour in USA and Mexico. In year 2008 ”Corpses of the universe” MCD/LP is released for japanese Obliteration Records. The band is touring again across the Europe and makes the big Russian tour. In year 2009 two split EP’s are released... ”Heartburn result” with swedish REGURGITATE and ”Furniture obsession” with spanish HAEMORRHAGE. The band will also appear at official tribute albums for NASUM and DANZIG. Years 2010-2014 bring nothing but continuous shows and tours across the Europe, Russia, USA, Mexico, and for the first time over one month tour in South America. Selfmadegod Records releases on vinyl “Surgical disembowelment” and “A chapter of accidents” albums. In 2014 the same label makes “Looking for victims”, split EP with another polish band PARRICIDE. In the meantime Hal gets the offer to play in VADER and leaves the band. He’s replaced briefly by Lis. In beginning of 2014 Yaro is new bass player. Year 2015 is 25th anniversary of the band and special shows, tours are prepared. As well as anniversary album containing old songs chosen by fans and newly recorded.